Milk and dairy products in general are considered the most important foods for calcium intake because the calcium in milk is among the best absorbed and because milk contains a host of other nutrients that are beneficial to your health. However, milk consumption has declined in the United States as people seek to reduce calories and fat intake, on one hand, and replace milk with non-nourishing beverages on the other. With women over 60 consuming only about 60% of their recommended calcium, how we get our calcium has become an important public health issue. One disturbing trend affecting bone health is the replacement of milk as a beverage with carbonated sodas. While some parts of the population cut out milk to reduce calories, others are replacing milk with empty calories in the form of a carbonated, sugar-filled beverage. 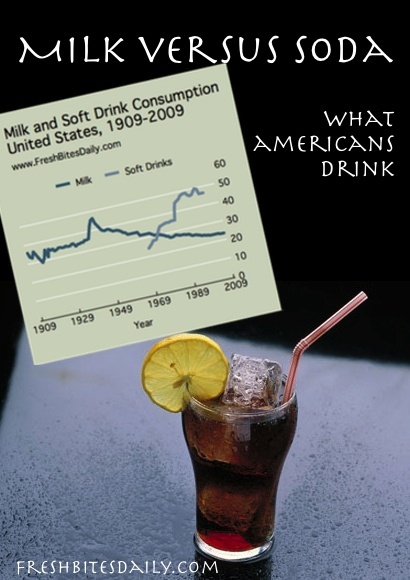 We only have soda consumption data available for this site since the 1970s but the fact is that in the 1940s, United States residents consumed about four times the milk as they did soda. 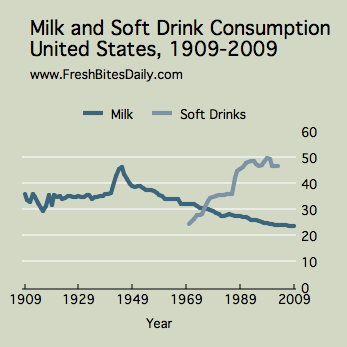 In the 21st century, soda consumption far outpaces the consumption of milk. Keep it out of your pantry and cupboards. Perhaps limit your sodas to times when you are out of the house. Replace a few sodas with another beverage. Replace a few with water. Flavored waters and iced teas are other options. Explore some homemade soda options, keeping the sugar content low. A concept like this chamomile soda (here) is a fun one.